Gifts for Bike Commuters - What We Wish You'd Buy Us! 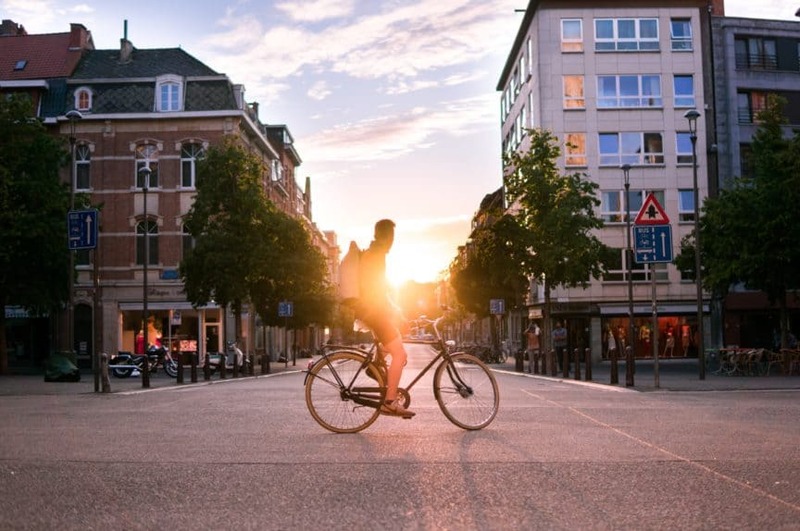 If you’ve been racking your brain trying to think of some bike commuter gift ideas and you just can’t decide on the right thing, try some of the suggestions below. Buying presents for other people is usually a painful and frustrating task. The great news for you is that your friend, or sister, uncle, brother, aunt or whoever you’re looking to buy a present for is a bike commuter. Your search has been narrowed down to “bike stuff” only. You’re glad to have narrowed the gift search, but it still isn’t easy to figure out exactly what to purchase. That’s where I am here to help! Whether you’re searching for the perfect Christmas present for a coworker, a birthday gift for your hubby (you know he doesn’t really want another dress shirt), or just to say ‘thanks’ to a friend…take a look at these bike commuter gift ideas. There’s got to be something in here that they’ll like. It’s a debate in the world of cycling whether it’s safe to ride with headphones on or not. I ride with headphones, but make sure they aren’t noise canceling. I need to be able to hear ambient noise around me. My recommendation for great headphones are the Bose SoundSport Wireless. These things are amazing, because they’re wireless. No wires feeding through your shirt or getting tangled in your helmet. Secondly, the audio quality is superb. For the price you can’t ask for better sound. They’re also made to withstand sweat, and won’t fall out of your ears. These headphones are perfect as a gift for your bike commuter so that he/she can listen to music or binge-worthy podcasts. You can see their current price on Amazon. Ok, maybe I am a weird cyclist, but I can never have enough of these socks. The SmartWool Cycling socks are a gift from the sock gods. They are warmer, more snug, they don’t get clammy when wet, wick moisture, and don’t stink. Plus you can machine wash them repeatedly. I have a hard time justifying purchasing a pair of socks for $15 which is why they make a great gift. Lots of different colors and variety of wool cycling socks here on Amazon. It’s not easy to keep a bike shop up and going these days with the ease and convenience of online retailers. With this said, it’s nice to support the local shop. Why not get your bike commuter a gift certificate to their local bike shop? They can use it for a bike repair, to purchase some bike tubes, or maybe a new cycling kit? This is a win win for your friend and the local bike shop. Create your own bicycle related art or purchase some. Years ago I took photographs of my favorite bicycle and had prints made. I framed them and decorated a room with them. It was cool, personal, and made for a great decoration. Get creative and make art that’s bicycle related and gift it! You can also purchase lots of cool art found on Etsy. 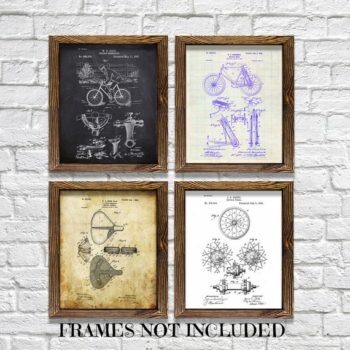 These prints of bicycle patents are really cool, and could be the perfect gift for your bike commuter. You can view them on Etsy here. This one might not be for everyone, but definitely for the handy bike commuter. Bicycles need maintenance and cleaning from time to time. Some bike commuters would rather not bother with their own maintenance and prefer to take their bike to the local bike shop for a tune up. Other bike commuters (like me) prefer a hands on approach to bike maintenance. Working on and cleaning a bicycle is made difficult without a bike repair stand. This stand will hold the bike off the ground keeping the bike from falling over or rolling away. Very convenient for bike maintenance. You can see one on Amazon here. Strava is a free mobile app that tracks data while you’re out on a bike ride. I use it for every ride I take and it calculates my speed, distance, and lets me know how I rank against other locals. It’s a fun app that is completely free unless you want to pay for the monthly subscription. By paying for the subscription the app opens up more statistics, can show other Strava users where you are in real time, and enables other features. The added bonuses aren’t necessary, but they are nice. If your bike commuter uses Strava this would make a nice present. Full disclosure: I don’t get any kickback from Strava if you subscribe through this link. I just think Strava is awesome, and would make a great gift! Check out their subscription plans here. 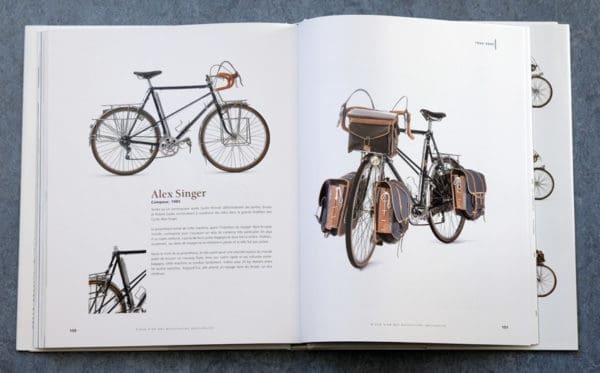 “The Golden Age of Handbuilt Bicycles” is the premier book on the history of handbuilt bicycles (see on Amazon). It contains beautiful photography of well designed bicycles that will make a cyclists mouth water. If your bike commuter loves bicycles than they’ll get a kick out of this book. It’ll also make them want to splurge and get a new bike. There are days when you have to ride in wet weather to get to work. We all manage in different ways to deal with rough weather. I put together a guide on how to bike commute in the rain, and in this guide gave tips on how to survive and thrive on a rainy day commute. One of the items that can really help on a rainy day commute is a proper jacket. I made a recommendation in the post mentioned above, but there’s lot of types and varieties. A proper cycling jacket will help keep the rider dry, but be breathable to let sweat out. Not every commuter wears a bicycling jersey. In fact, it’s not necessary and you can commute to work in normal clothes. But if your commuter likes to don a bicycle jersey on the commute than we have a great gift idea for you! Create a bicycle jersey for them! There are countless websites where you an upload an image and add text to create a unique jersey. I gave a personalized bicycle jersey to a friend as wedding gift. He absolutely loved it, and wears it on bike rides. Get creative and make a unique jersey for that special someone in your life. Most bicycles are wrapped in black handlebar tape. Over time the tape gets worn out and dirty. Why not purchase some new handlebar tape as a gift? Don’t get boring black! Pick out a fun color or one that matches the bike you’re getting it for. New handlebar tape is always a treat for cyclists. There’s lots of different colors at Amazon. They better already own a helmet and be wearing it! But if you want to get them a cool, trendy commuter helmet check out our helmet buyer’s guide. The Giro Reverb Helmet not only looks cool, but it literally saved my noggin. Can’t recommend it enough! It’s a functional gift, but every bike user needs to have extra tire tubes, patch kits, and the tools to make quick repairs. It might not be the most FUN gift, but it’s definitely a necessary one. Search for bike repair kits, and you’ll find lots of choices at varying prices. I asked my wife what she would want as a gift related to bike commuting. She commutes every day on her bike, and immediately said “stylish leather gloves.” Hopefully she won’t be expecting a pair anytime soon (her birthday is not even close!). As a bike commuter she doesn’t wear any special “cycling” clothes, but wears exactly what she will be wearing all day in the classroom (she’s a teacher). She said that the leather gloves would not only look good, but keep her hands warm on the cold morning commute. I can’t make a list of BEST GIFTS FOR BIKE COMMUTERS without this one on the list. Every bike enthusiast has another bike in their mind that they want. Even as a bike commuter I bet your friend/relative has a dream bicycle in mind. New bikes aren’t cheap, but if you really want to blow their mind buy their new dream bike for them.